Budapest Critical Mass — It’s Huge! Here’s an amazing video, beautifully shot by Daniel Fiantok and set to a Gnarls Barkley song, of the Budapest Critical Mass Earth Day ride on April 24. 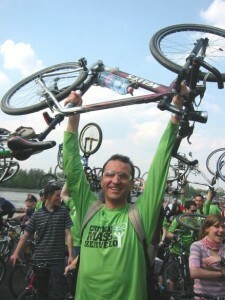 The Budapest ride is the largest on the planet, with tens of thousands of riders. Why is their ride so huge? Funny you should ask. Joel wrote a great piece a while back about this very subject. 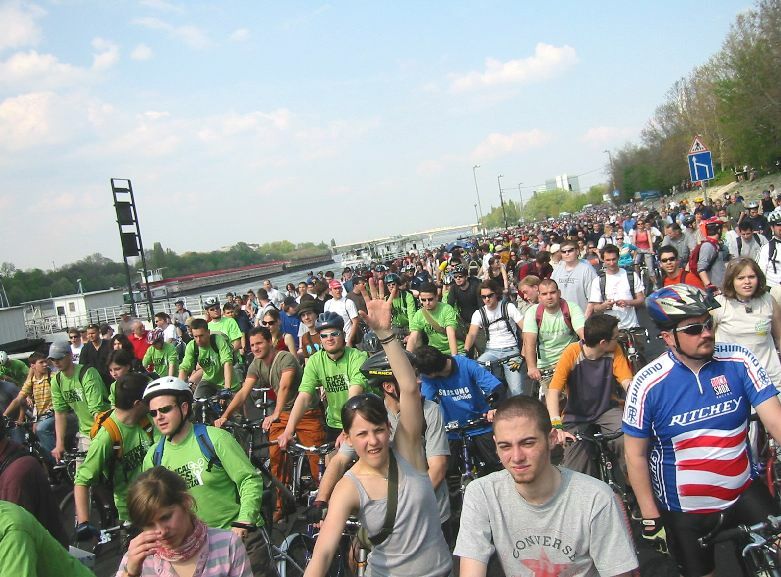 Why Is Critical Mass Budapest So Huge? Imagine a Critical Mass so large that it simply can’t begin in only one spot at only one meeting time. Imagine a Critical Mass “ride” with so many participants that nobody actually can ride for the first half hour because it’s too dense and slow as tens of thousands of bicyclists begin to move, walking their bikes, along a major urban highway. What I’m asking you to picture is Critical Mass at its biggest, in Budapest, Hungary. The ride in Budapest routinely and dramatically surpasses all other Critical Mass ride records for size. Why is that? On the one hand, why is it that the ride is so big? On the other, why aren’t all of them like that, in every large city? It’s easy to point to some of the superficial causes for CMB’s size: It’s only twice a year. The weather’s mild in April and September. Budapest is a capital city. It’s mostly flat. Bikes have been popular for generations in Hungarian cities. But to get to 40,000 riders and more, there’s clearly more going on. Budapest Massers, while cooperating with authorities, lift their bikes in the air en masse, a gesture that has come to represent defiance and territorial reclamation in American cities. Rather than point to all the promotion, civic organizing and volunteer effort that creates the ride (and there’s a lot), I’m most fascinated by the underlying reasons for all that effort. In this article, I’m going to build a hypothesis that the success of the ride is, as elsewhere, largely a reaction to intolerable interaction with cars. Historically, motorized transportation shifted from railroads to automobiles slowly in most places. The first private automobiles made a nasty reputation for themselves by getting stuck in mud easily, being loud, scaring horses, breaking arms (before the crank starter was replaced with a “self-starter” model), and careening through crowds of pedestrians trying to innocently cross the public thoroughfares. The problem of mud, alone, was at such a level that it influenced habits of etiquette into the 1970s, when I was taught to walk between a lady companion and the curb, so as to protect her from splashing mud. Let’s compare the American story with the proverbial frog placed into a cool pan of water and slowly boiled before it can know what’s happening clearly enough to jump out of the pan. Now let’s look at the frog in Budapest. Budapest under the Communists was a place of public trains, buses and streetcars, bicycles and serious pedestrian ways. People shopped on foot, near their homes—even in the new suburbs. Commuters used “tram” streetcars instead of cars. The first subway in the world was built in Budapest. And, of course, there were cars—but not very many. Only the well-connected and politically-favored could drive with any regularity, and an undercurrent of discomfort existed, reflecting a combination of fear, envy and resentment against power and special privilege, including car use. In 1974, only 80 out of each 1000 people in the population owned cars, and fewer still were using them for commuting. [Data from the Hungarian Institute of Transport Sciences.] Compare that to ownership rates of 480 per 1000 in the U.S. at that time. When the decade of the 1980s ended with the destruction of the Berlin Wall and the collapse of Soviet control over Eastern Europe, the white-hot culture of the automobile came blazing in. Suddenly the frog felt the heat. Unlike in places where roads had to be slowly paved and extended, an infrastructure capable of supporting high-speed car use was already in place, inviting its use. The opportunities offered when Communist corruption was replaced with Capitalist corruption (and marketing) were similar to those in the recent U.S. housing scandals when banks were newly allowed to make housing loans even to those unable to afford them. Suddenly in Budapest more than half the adult population made it one of their top priorities to own and use a car. People who could barely afford one bought cars to enhance their business opportunities, and their self-respect in the new eyes of a scorching fast culture. By 2004, the car ownership rate in Budapest was 350 per 1000 residents. To summarize, the Budapest frog went from cool to hot in a very short time. The Budapest Critical Mass is evidence of that leap. A quick look at how Critical Mass is viewed in Hungary gives insight into the confused nature of the politics simmering in reaction to the onslaught of cars and dangerous streets on a large, accelerated scale. When I arrived in April 2006, I saw major promotional materials about the ride in the most unlikely of places, by San Francisco standards. A contingent of hundreds of route monitors leads the ride. The uniformed volunteers peel off in pairs wherever safety monitors are to be stationed. The streets used for the ride are already closed for the entire day by the police, so Budapest's monitors generally act as a buffer between the ride and pedestrians. The free tourist booklets advertising hotels and nightlife were promoting it—on the front cover. Full size billboards beside the Danube River were promoting the ride. In the newspaper editorials, party bosses and union leaders from all political lineages were promoting the ride. Recumbent bicyclists were promoting the ride with large sign board trailers. Needless to say, I had to participate. So I borrowed a bike from my hotel, went out on the street, and flagged down every cyclist I saw. 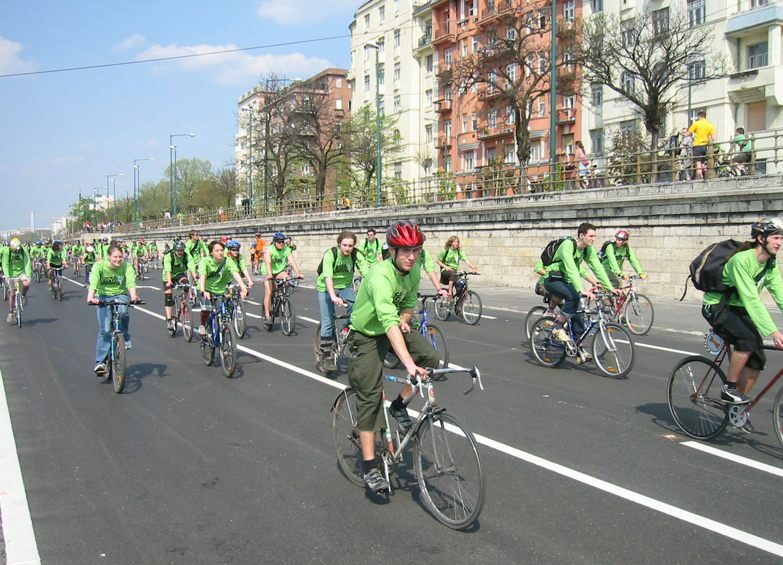 Each had a different answer to the question of when and where Critical Mass Budapest began. This is how I learned that the ride started in multiple places, each contingent setting a time corresponding to how far it was from the official congregation point along the river. When my section of the ride had gone two miles down the river, across the bridge, and then two more miles back north along the other side, I could easily see the crowd across the river. The official starting point was still thick with contingents just beginning the Critical Mass route. We were told that there were 32,000 riders that day. I don’t doubt it. What I found, though, was a ride with a balance of celebration and politics that I couldn’t quite calibrate. The ride took over the city, with police cooperation, road closures, official shirts and safety monitors. But I couldn’t find one person who could explain why this outpouring hadn’t yet translated into policy changes suppressing the growth of the automobile. Every ride since has topped 40,000—and yet city officials are still promoting infrastructure for cars, trying to balance it with new bicycle measures. The ride gets going slowly, because of the extremely dense crowd. As I’ve seen in my visits to rides from Chapel Hill to New York, from San Francisco to Rochester to Rome, the draw of a city’s Critical Mass seems to correlate directly to the absolute quantity of bicyclist frustration on the streets. If the infrastructure makes bicycling a non-issue, as in Amsterdam, or the overwhelming control by cars suppress bicycling altogether, there is no Critical Mass ride. In locations with a small number of cyclists or very polite automobilists, there is a small ride. Where there is a difficult street experience and a large number of bicyclists, there is guaranteed to be a large Critical Mass. Nowhere do these conditions converge so dramatically as in Budapest. For a few years now, the Budapest frog has been jumping. As we pass the twentieth anniversary of the end of Communist control in Hungary, when will Budapest’s frog find its way out of a pan that has grown very large? On the weekend of Critical Mass in Budapest, our hotel is sponsoring a sports car rally. 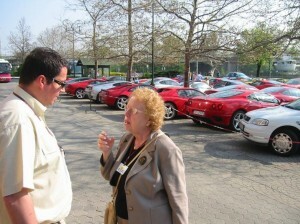 That's my mom complaining to the tour leader about the long bus ride she's about to be forced to take. Our attempt to spend a week on a riverboat was thwarted by the "hundred year flood" that devastated the region. Is there a metaphor in that?